With StogieGuys.com heading toward its eighth anniversary in May, now seems like a good time to take a few minutes to look at the amazing amount of material stored on the site and offer some tips on how you can take advantage of it. First, check out the references across the top. There, our material is curated into categories to make it easily accessible and useful, whether you’re a raw beginner or a grizzled vet. Just below and to the right is a link to information about Stogie Guys, including our policies and short bios. The Reviews Archive is alphabetized, and there’s a separate list of our top-rated smokes, along with an explanation of our reviewing system. 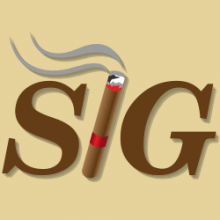 Around the page you’ll see ads from our advertisers, sometimes with special Stogie Guys offers. Check them out. They help keep us going. Down the side of the page, there are links to other segments, such as the incredible A-Z Guide to Bourbon and the extensive Cigar University. And don’t forget that little search window in the upper right of the page. Type in a topic and you’ll likely find we’ve had something to say about it. Searching for some new sticks to try? Explore our Gold Star Smokes. Interested in exploring coffee to go with your smoke? As with many topics, you’ll likely be surprised at how much we’ve written on this. We focus on cigars, writing about them from Latin American farms and factories to conventions and get-togethers—and everywhere in-between. We take a broad view of cigar enjoyment and try to enhance the experience in any way we can. Sometimes that means delving into regulations and legislation, sometimes it’s an interview with a local tobacconist. Sometimes it is simply reflecting on the joys of a fine cigar. Our overriding goal is to make StogieGuys.com the best site we can. That includes careful archiving and assembling material for our readers. To that end, we’re always interested in hearing from you. If there’s anything you’d like to see, just let us know. You can always leave a comment or, if you prefer, email one of us directly. And stay tuned. You won’t want to miss our birthday celebration! Last year's birthday celebration, if I remember correctly, was an epic cigar giveaway. Looking forward to seeing what you guys do this year — hopefully I can win!